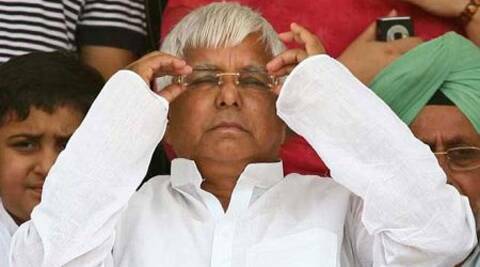 An eviction notice had been sent to Lalu three months ago, when he ceased to be MP after being convicted in a fodder scam case. The Ministry of Urban Development took the cabinet route to allow Lalu to retain a bungalow on Tughlaq Road, accepting his plea that his wife was ill and required regular visits to AIIMS. Going through its final weeks, and days before the model code of conduct comes into force, the government is handing out favours to a range of people — from politicians to bureaucrats to police officers. The Ministry of Urban Development on Wednesday took the cabinet route to allow RJD chief Lalu Prasad to retain a Type VIII bungalow on Tughlaq Road for another year, accepting his plea that his wife was ill and required regular visits to AIIMS. An eviction notice had been sent to Lalu three months ago, when he ceased to be MP after being convicted in a fodder scam case. Sources said Lalu wrote to UD Minister Kamal Nath, mentioning Rabri Devi’s illness and the fact that his grandchildren studied in Sanskriti school nearby. On Wednesday, the Cabinet Committee on Accommodation (CCA) granted Lalu’s request, even though he is neither an MP nor the head of a national political party (the RJD ceased to be one after the last elections) — pre-requisites for allotment of a bungalow in the heart of VIP Delhi. Another beneficiary is the son of former prime minister P V Narasimha Rao, who was allowed to retain for a year a Type V bungalow in Telegraph Lane after he wrote to the PM saying the premises contained several memorabilia of his late father, and was an “inspiration” for people from Andhra Pradesh. The CCA also waived the market rent — of around Rs 10 lakh — for former home minister Buta Singh, who had been overstaying in a government bungalow, and was pulled up last year by the Supreme Court. Buta will now pay only a “special licence fee” of approximately Rs 13,000, source said. The rent has been reduced to a licence fee also for the family of Congress leader K Karunakaran, who have been staying on in government accommodation even after his death in 2010. The family of former minister Sisram Ola, who passed away last year, too, has been allowed to keep his government accommodation for one more year. Manipur Governor V K Duggal has been allotted a C-II type flat, even though he is entitled to sprawling accommodation in Imphal. The ministry also de-earmarked two bungalows meant for the commissioner of police, Delhi, and director, Enforcement Directorate, from the panel of official residences allotted to these posts. This was done on the request of the bungalows’ present occupants, B S Bassi and Rajiv Katoch, the officers who currently hold the two posts. De-earmarking means the officers will be able to retain these house for eight months after they have retired in 2016.